The historical Buddha of our present era, Shakyamuni, is depicted here seated in vajra-posture upon a moon disc, multicoloured lotus, and an ornate throne that is supported on each of its four sides by a pair of lions. 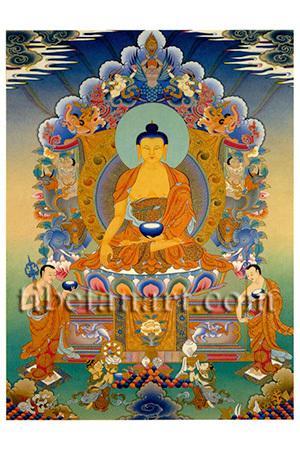 Shakyamuni is golden in colour and wears the three red robes of a Buddhist monk. His left hand rests upon his lap in the gesture of meditation with his palm supporting a blue alms-bowl full of nectar, and his right hand is extended downwards to touch the ground in 'earth-witness' gesture. To his right and left are his two main disciples, Maudgalyayana and Shariputra, who each stand upon a mat and hold the two monastic attributes of an alms-bowl and an iron mendicant's staff. An assembly of jewels and auspicious offerings appear in front of the silk brocade square that hangs in front of the throne. Kneeling at either side of these offerings are the two great Vedic gods: four-faced yellow Brahma, who holds aloft a golden wheel; and white Indra, who holds aloft a white conch shell. Various other jewels and auspicious offerings appear in the bottom corners, and ascending behind Shakyamuni's golden aura and green halo is his 'six ornament throne of enlightenment'. At the base of this throne or torana are two elephants, with mythical hybrid creatures known as sharabha standing upon their backs. Two young gods ride upon these sharabhas, with their hands holding aloft a jewelled crest bar. Upon this bar stand a pair of water-dragons or makaras, a pair of serpent-spirits or nagas, and the crowning form of Garuda - the 'lord of all birds'.